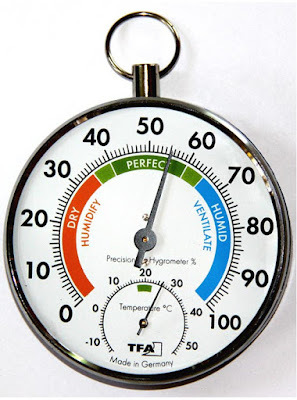 Home » Hygrometer , Instruments » What does a hygrometer measure? What does a hygrometer measure? A hygrometer is an instrument which measures the water vapor in the atmosphere. This is also referred to as the “relative humidity” in the environment. All weather meters that measure relative humidity are also known as hygrometers. Hygrometer, an instrument used in meteorological science to measure the humidity or amount of water vapor in the air. Several major types of hygrometers are used to measure humidity. A hygrometer is a weather instrument used to measure the amount of humidity in the atmosphere. There are two main types of hygrometers – a dry and wet bulb psychrometer and a mechanical hygrometer. Humidity measurement instruments usually rely on measurements of some other quantity such as temperature, pressure, mass or a mechanical or electrical change in a substance as moisture is absorbed. By calibration and calculation, these measured quantities can lead to a measurement of humidity. Modern electronic devices use temperature of condensation (the dew point), or changes in electrical capacitance or resistance to measure humidity differences. The first crude hygrometer was invented by the Italian Renaissance polymath Leonardo da Vinci in 1480 and a more modern version was created by Swiss polymath Johann Heinrich Lambert in 1755. The maximum amount of water vapor that can be held in a given volume of air (saturation) varies greatly by temperature; cold air can hold less mass of water per unit volume than hot air. Most instruments respond to (or are calibrated to read) relative humidity (RH), which is the amount of water relative to the maximum at a particular temperature expressed as a percent. A hydrometer or areometer is an instrument that measures the specific gravity (relative density) of liquids—the ratio of the density of the liquid to the density of water. Thanks for reading What does a hygrometer measure?